Heavy rain on Saturday caused flooding in several places around Delaware County. Blue Limestone Park in Delaware was closed to traffic because high water overtook much of the park after Delaware Run poured out of its banks due to the heavy rain that fell for most of the day. John Street and King Avenue near the park remained closed on Sunday due to high water in the area. Heavy rain Saturday caused flooding in parts of Delaware County. Images of high water were posted to social media as rains fell on Saturday morning and throughout the day. The National Weather Service in Wilmington reported that by 11:46 a.m. Saturday, 1 to 3 inches of rain had already fallen across central and western Ohio. Officially, 1.93 inches of rain fell Saturday in both Delaware and Ostrander, according to the National Weather Service. Radnor reported 1.87 inches of rainfall. In Ashley, 1.85 inches of rain fell. In Sunbury and Galena, 1.29 inches of rain was reported. Westerville reported 0.75 inches of precipitation. The total reported amount in both Powell and Dublin was 0.54 inches. In Shawnee Hills, 0.32 inches of rain fell. 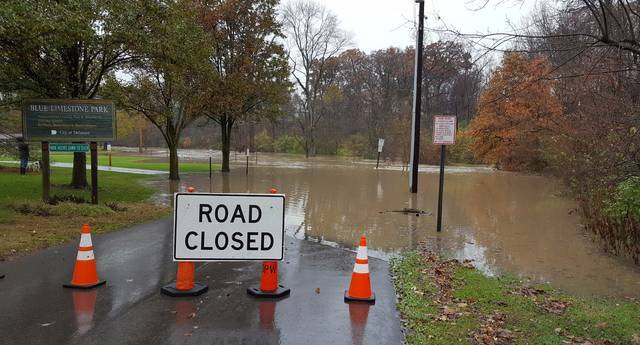 On Sunday, City of Delaware spokesman Lee Yoakum said flooding was occurring along Delaware Run, prompting officials to keep John Street and King Avenue closed near Blue Limestone Park. Yoakum said all other city streets were open Sunday. On Saturday, Delaware Police closed Troy Road north of Eastwood Avenue and reported water in the travel lanes on US Route 36 West between Springer Woods and Section Line Road. Crews closed Curtis Street at the curve where it intersects with South Street. Those roads were open Sunday. Following the heavy rain and mild temperatures on Saturday — the high was 60 degrees in Delaware — the thermometer took a dive into the 30s on Sunday as a blast of cold air moved in behind the wet weather. Wind chill factors dipped into the 20s Sunday. The National Weather Service forecast to kick off Thanksgiving week in Delaware County is calling for sunshine with high temperatures in the mid to upper 40s today and Tuesday. Lows are projected to be in the 30s tonight and in the 20s on Tuesday night. The forecast for Wednesday is mostly sunny with a high of 37 degrees and a low of 24. The Thanksgiving Day forecast is calling for mostly sunny skies and a high of 39 degrees. Thanksgiving night will bring partly cloudy conditions with a low of 26 degrees. On Black Friday, shoppers can expect fairly pleasant conditions, with mostly sunny skies and a high of 42 degrees. A slight chance of snow showers is predicted for Friday night and Saturday. But this is Ohio, of course, so all weather forecasts are subject to change. Constantly.